These kind of patterns can be used for embroidery panels too. 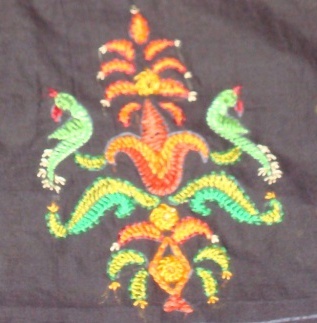 Wall hangings, bags cushions are embellished with this gujarati embroidery. More on my next post. 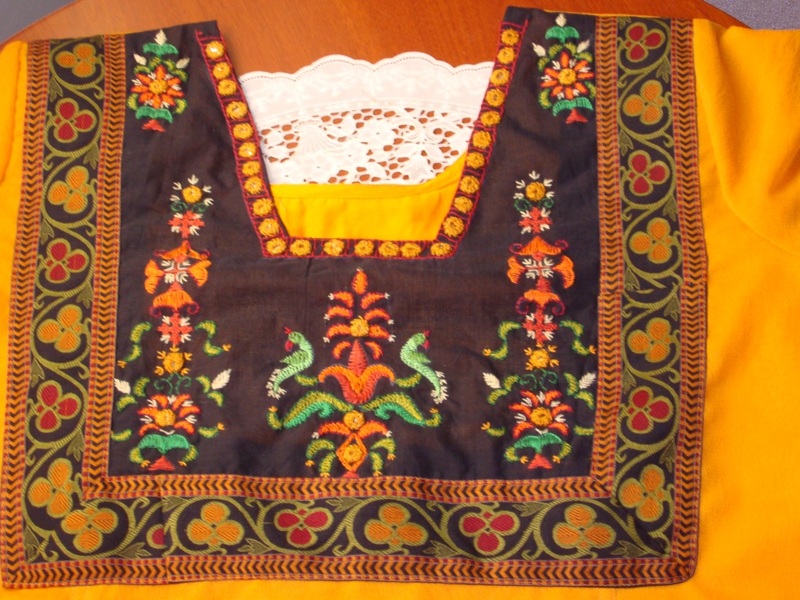 The yoke pattern on which the embroidery is done, has detailing of motifs, kutchwork and mirrors. 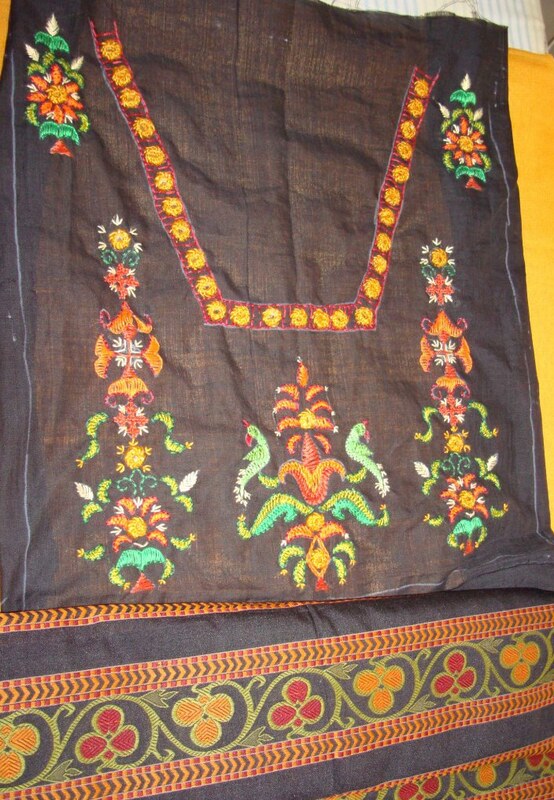 The kutchwork is worked together with the motifs, the mirrors are also stitched over the motifs. Other than that a line of mirrors are stitched along the neck line. The mirrors are worked in yellow thread [ the same bright yellow] with buttonhole outline worked in red thread. The rest of the yoke on my next post. I had this really bright yellow dupatta[ scarf] which did not have matching suit to go with it. it was so bright, if it worn during daylight, it flashed on your eyes. We call it ‘Govinda yellow’! this material needed some treatment fast! 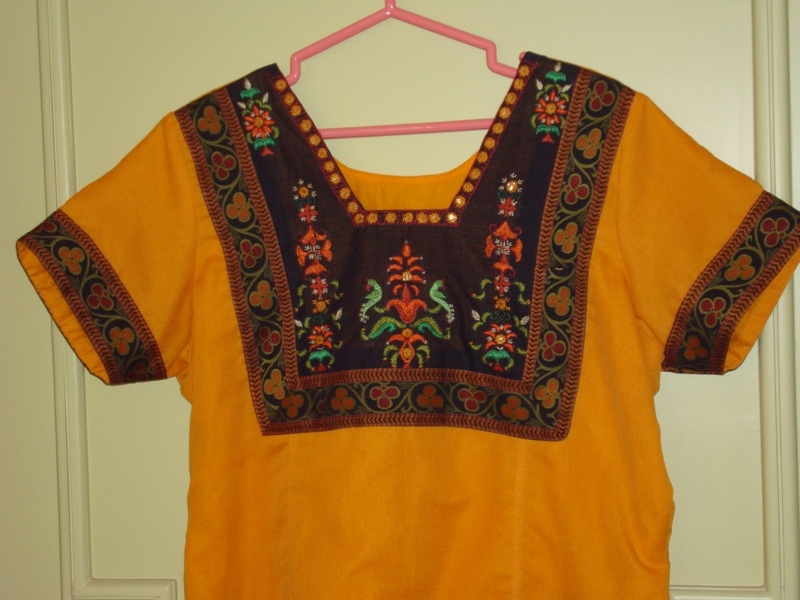 so it was turned into a dress top with embroidered yoke. I also had a black woven border, which had yellow, red and green colour on it. this border colours decided the thread colours for embroidery. 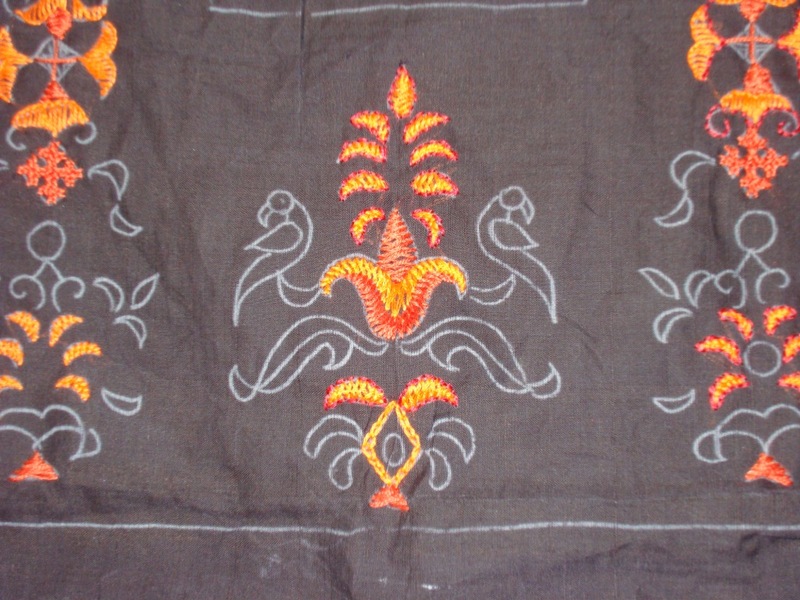 I decided to do embroidery on black yoke, outlined with this border. 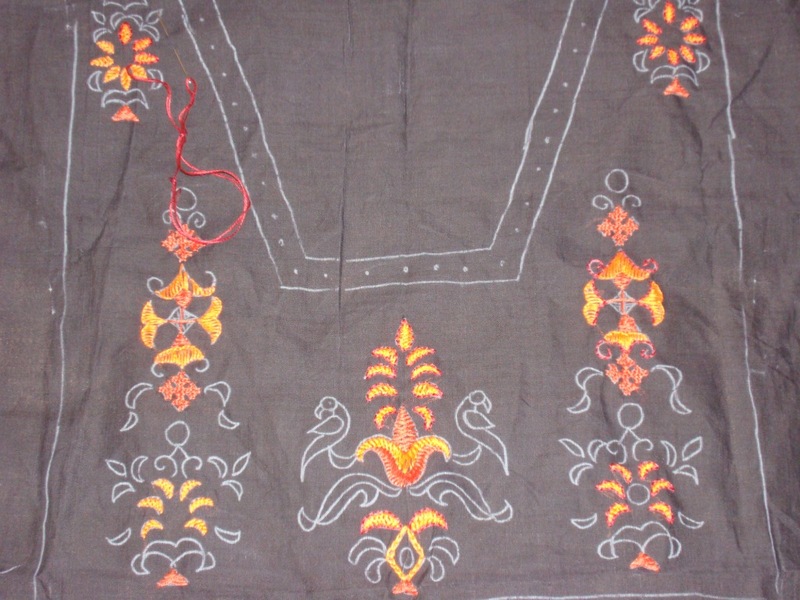 The pattern chosen – some ethnic motifs from Gujarati embroidery with mirrorwork. Along with the usual floral motifs , a parrot design was also added to the motifs, though I am vary of using birds and animals on yokes, with this bright yellow, caution was thrown out of the window,and the parrots landed on yoke. 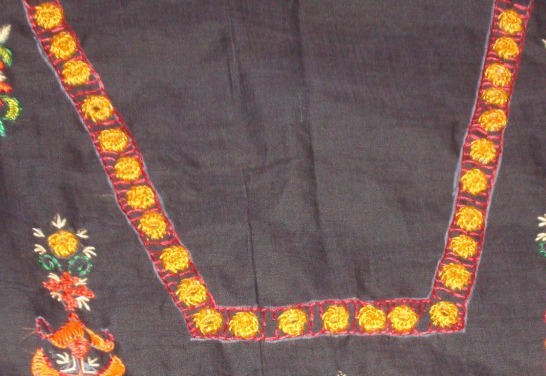 The stitches are typical of Gujarati embroidery, herringbone filling with chain st outline, and kutch work. Till now I have not shown the bright yellow tunic , did not want to scare away anyone! LOL!